Discuss as a class: what lessons were passed on to you by a parent, grandparent, or any other family member? Work out who in the class was taught the ‘oldest’ information e.g. stories from a world war; old family recipes etc. Encourage students to bring in any interesting items for a show-and-tell. Look up a variety of definitions of the word ‘culture’. Write a class definition of what ‘culture’ is. a) What does he say about how these stories were passed on to him? b) Do you think that oral history like this is more or less reliable than history or information that is officially recorded e.g. in books, journals, government sponsored newsreels or films? 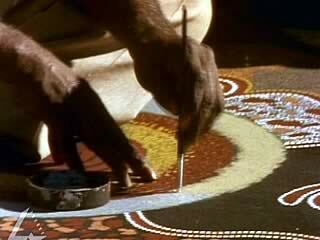 At the opening of the video clip, images of the actual desert are juxtaposed with symbolic representations in an Aboriginal artwork. a) Why have these images been juxtaposed? b) In what ways can a greater understanding of the concept of Belonging be developed through the use of symbolic representation rather than a more realistic style of painting? Devise a set of 5–10 symbols to represent the significant places, people and practices in your life. Use drawing, painting, collage or computer graphics to create an A3 sized artwork using your own symbols (include these as a key) to represent the cultural practices of your family or community. Write an essay that compares and contrasts the ways in which the central character in this video clip (Michael Nelson Tjakamarra), and the central character of your set text, feel a sense of belonging to their culture.